I had never eaten a Date in my life. Until recently when the wonderful Door to Door Organics brought me some. See, I get a bi-weekly order of assorted organic fruits and veggies delivered right to my front porch by those wonderful folks over at Door to Door Organics. They suggested that I get some of the beautiful, sweet, good for you Medjool Dates before they're gone. Gone? I had to investigate. 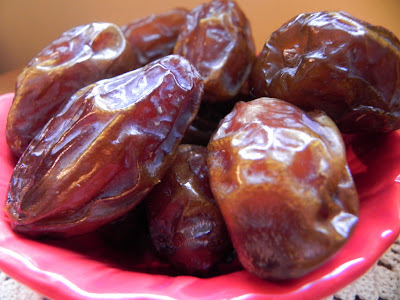 And everywhere that I searched on the internet said that these are the best Dates. Ever. That if you're going to eat a Date that this was the one to eat. So when I got my Friday e-mail from Door to Door Organics I logged into my account and added some Medjool dates to my box for delivery. ﻿They are everything those Foodies described them being! Anyone know any good Date recipes? I have quite a few.